Is reach more important, or is engagement more important? Are comments your top priority or are clicks to your website higher priority? Any one size fits all “best time to post on Facebook” should be taken with a grain of salt. That’s not to say their data is flawed. It’s just THEIR data…not yours. Consider it only a starting point for your own tests and analysis to discover what gets your business results based on the unique behaviors of your audience. What’s the best time to post on Facebook for your business? …and I’ll show you how to dig deep into your Facebook Insights to get your very own answer. Hint: Excel pivot tables are involved. But don’t worry, I’ll take you through step-by-step. 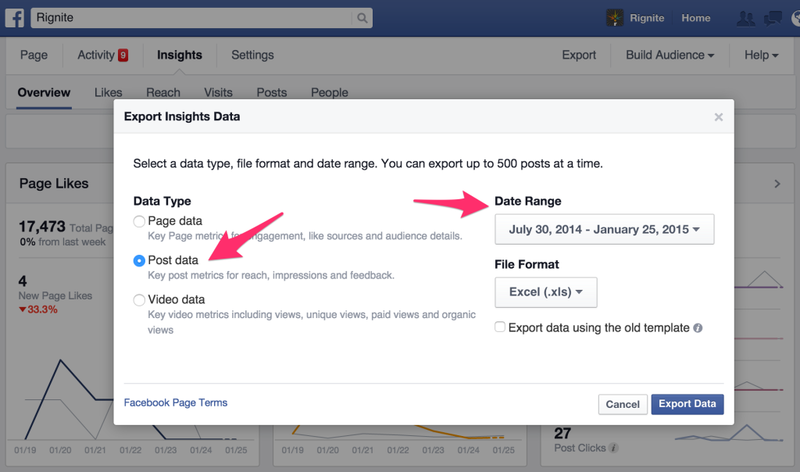 You can learn a lot in a quick glance at Facebook Insights. Hop over to the “Posts” section and take a look at the “When Your Fans Are Online” tab. This won’t tell you the full story. But it’s a good starting point. It gives you a high level understanding of when your fans are on Facebook. We’ll get to that in the next section. Let’s look at Rignite’s Facebook Insights as an example. In the screenshot below, you’ll see that the volume of people doesn’t change too drastically by day of week. Most days around 15,000+ of our fans are online, with a very minor dip on Tuesdays to 14,700. In terms of time of day, there’s a pretty stable volume of our fans online between 8am-7pm. 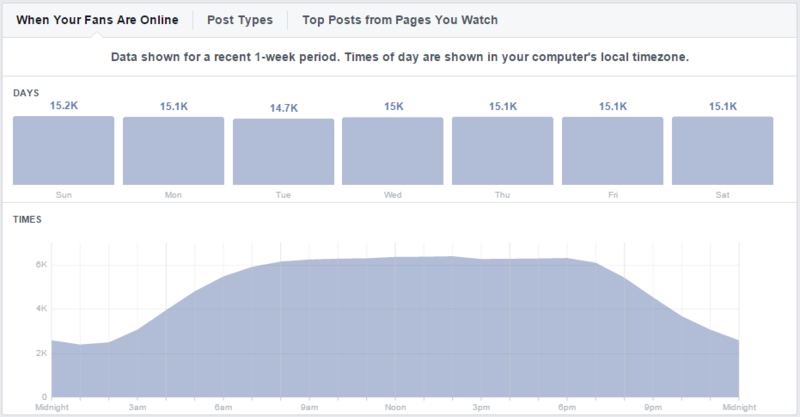 Does that mean we can conclude that Monday thru Sunday 8am-7pm are the best times to post on Facebook? That just gives you a very broad range for you to test your posting times. Note: Be sure to look at your own Insights to see what days and times stand out for your audience. Rignite is a software solution that makes it easy to get results from social media marketing. 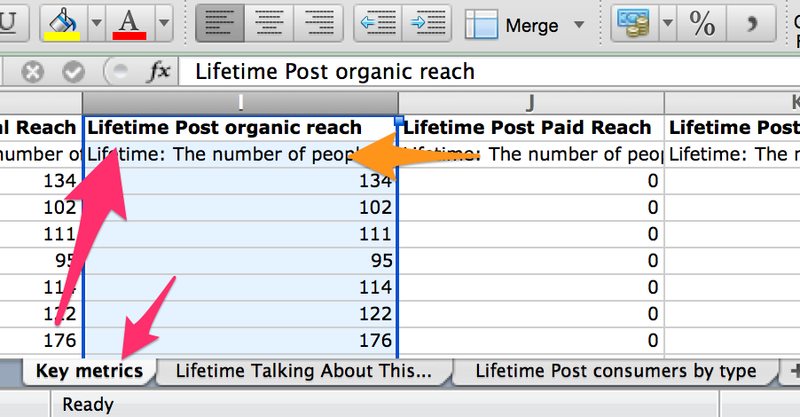 After you’ve tested posting at a wide variety of days and times for several months, you’re ready to do some simple analysis in Excel that will tell you the best times to post for your Facebook audience. I’ll show you step-by-step how to analyze your Facebook activity based on your specific goals. Go to your page’s Facebook Insights. Click Export toward the upper right. Then select Post data and choose a date range. I recommend going back 6 months so you’ll have sufficient data to get meaningful results. When you open the exported file, you’ll see about 13 different tabs that all seem to have very similar data. Don’t get overwhelmed here. We’ll only be using data from 3 of these tabs. If you’d like to keep your file distraction free, feel free to delete any of the other tabs. The metrics you use to analyze the best time to post on Facebook will be based on what’s important to your marketing goals. For some it’ll be reach, for others it’ll be engagement, and still others it’ll be link clicks. Or you might also look at a combo of all of those. Let’s get all that data into a single tab so it’s easy to manipulate the data and look at it from different perspectives. We’ll use the Lifetime Talking About This tab to combine the key metrics. Double check that the day of week is correct and then apply that formula to the rest of the rows. Confirm that calculation worked accurately and then apply it to the rest of the rows. 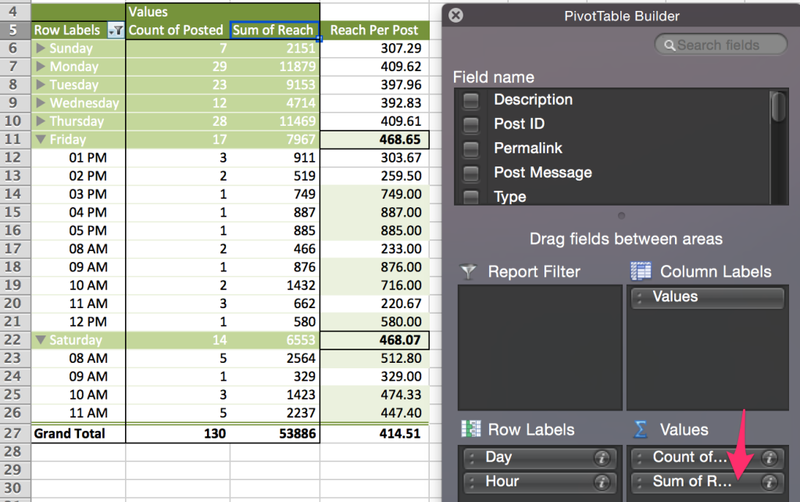 Copy and paste the reach data from the Key Metrics tab. I use the Lifetime Post organic reach column (I) because I want to know what day and time gives me the best reach without needing to boost it with paid ads. Caution: When you copy and paste the data from the Key Metrics tab to the Lifetime Talking About This tab, the rows will be off by one. That is because of the description line on row 2 (see orange arrow) that doesn’t exist in the Lifetime Talking About This tab, so be sure to copy the data over so it lines up properly. Copy and paste the link clicks column (I) from the Lifetime Post consumers by type tab into the Lifetime Talking About This tab. Now you should be ready to analyze your data. Now let’s bust out some good ol’ pivot tables! 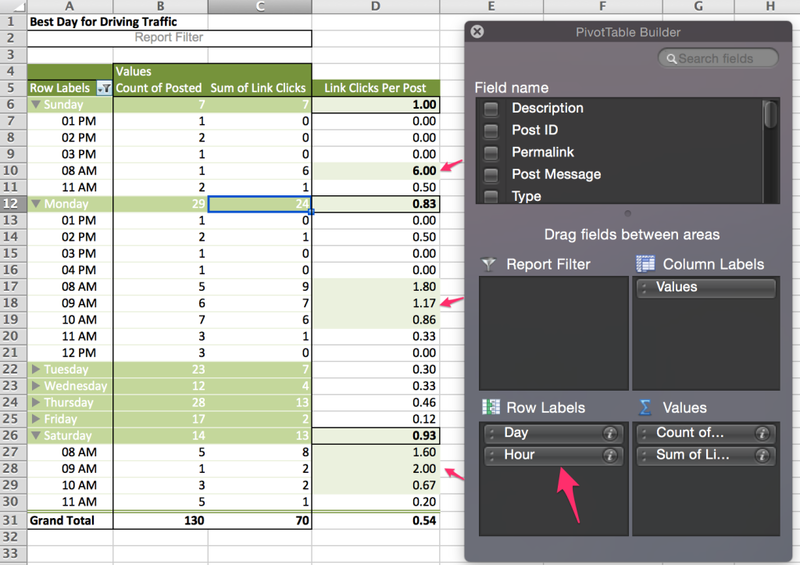 When prompted, allow it to create the Pivot Table in a new worksheet. For this first analysis, let’s assume your top priority goal is link clicks. We’ll start by analyzing which day of the week is best for driving link clicks. This data is a little misleading. The number of link clicks on Monday is the highest, but notice that we’ve also posted the most on Mondays. The best way to know which day has been most effective at driving link clicks is to calculate the Link Clicks Per Post for each day of the week. To do that, just add a column to the right with a formula that calculates the “sum of link clicks” / “count of posted” for each day. Now you can see that Sunday, Monday, and Saturday perform higher than the average Link Clicks Per Post of .54. But what about time of day? 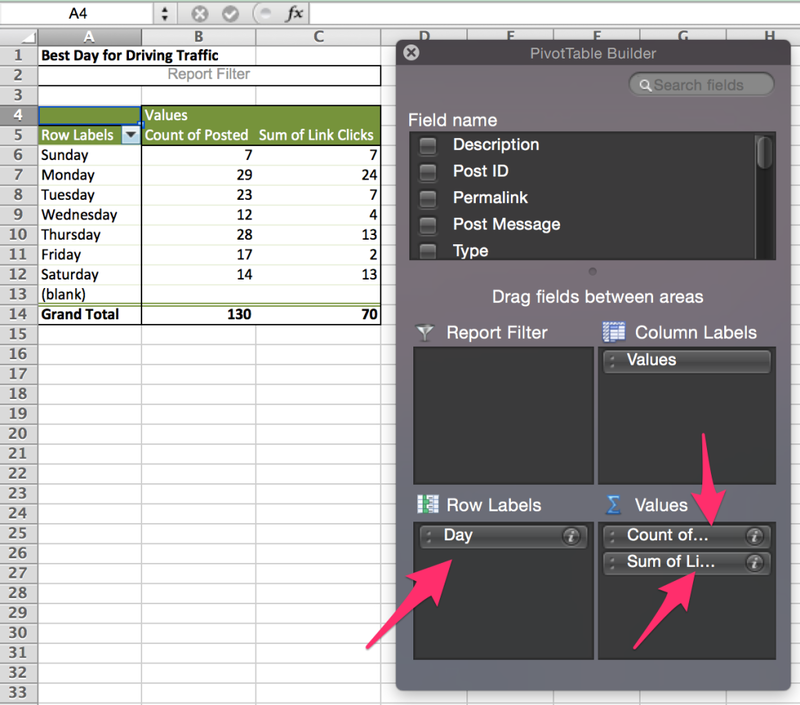 Go back to the PivotTable builder and drag the Hour field into the Row Labels box. Then you can expand each day to get a breakdown by hour. Expanding the days that have performed higher than average, you can then drill down to see what times of day are the best within those days. Note: It’s worth looking into the hours of all days to find those that perform better than average even if the day as a whole didn’t do well. For the sake of this post, I’m starting with the most effective days and then drilling down into the hours on only those days. I also haven’t tested the early evening hours and I know from the section above that my audience is online until 7pm. So maybe I’m missing an opportunity. Maybe I should test posting between 5-7pm and see if there are any peaks in the evenings. Now, let’s say you want to know–when is the best time to post for getting engagement? 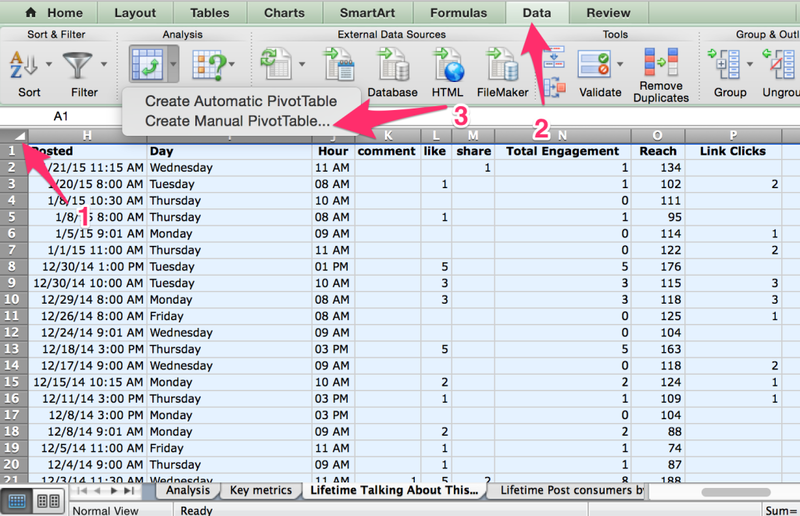 You can either create a new pivot table from scratch, or you can simply edit the one you just created. 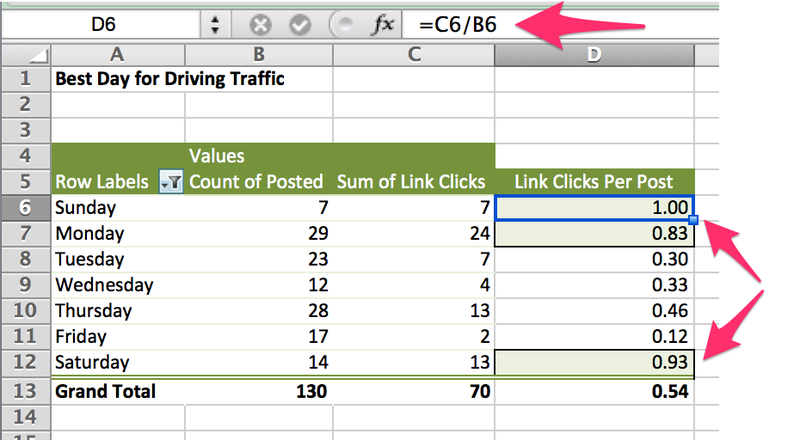 To edit, go back to the PivotTable Builder and remove the Sum of Link Clicks from the Values box. 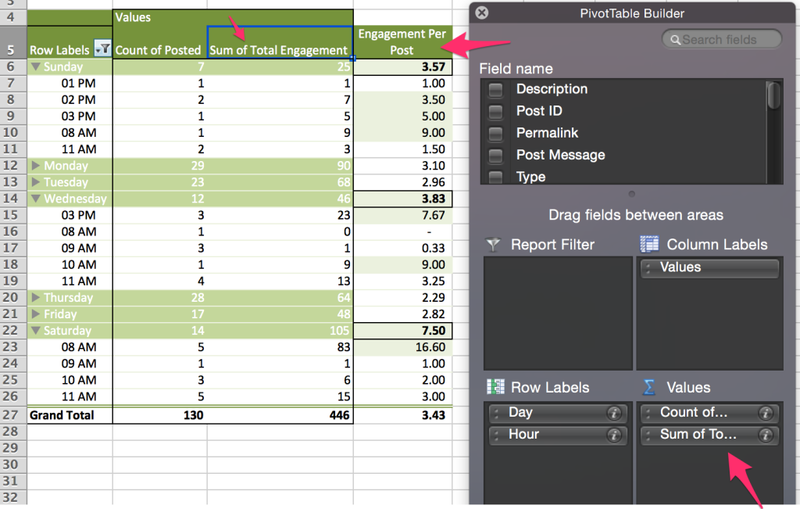 Drag the Total Engagement field into Values box and choose the Sum function. For the calculated field on the right, change it to Engagement Per Post. Again, I like to focus on the days and times that perform better than the average shown in the Grand Total line. Early morning on Saturday and Sunday around 8am perform well. Maybe I should test posting a few hours before and after that to see if those times also perform well. The afternoon of Sunday and Wednesday around 3pm perform well. I haven’t posted at that time on Saturday, so I should test that. I also haven’t tested posting a few hours after then, so maybe I should broaden my times to include 3-5pm to see if those later hours also perform well. Ok, now what if your goal is to post at the best times for reach? 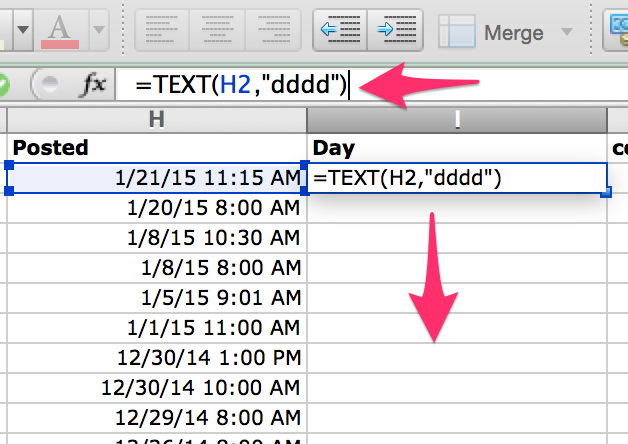 Again, let’s make a simple edit to the pivot table. 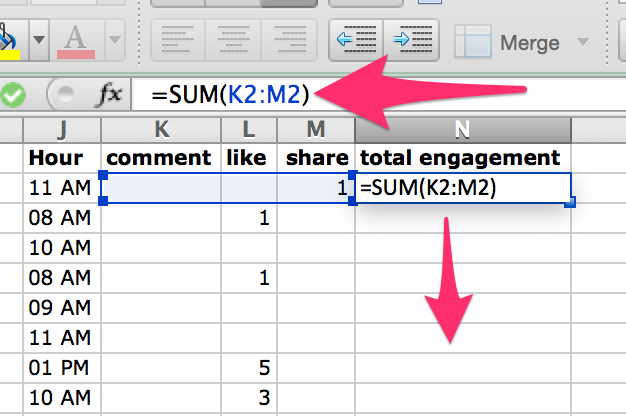 Remove Sum of Total Engagement from the Values box, and add Sum of Reach. It’s interesting that Friday and Saturday get the highest reach when Friday has not performed well at driving engagement or link clicks. When digging into the times on Friday that got the most reach, you see that we’ve really only posted 1-2 times for each of the highest performing hours. Maybe we should try posting more often from 9-10am and 3-5pm. With more posts, we’ll have more data to see if engagement and link clicks could perform well during those times, since we are reaching more people. Reach on early morning Saturdays performs consistently with link clicks and engagement. So we can assume that’s a pretty good time for us to post on Facebook. OMG Kim. That is just amazing. Thank you so much. Kim – Awesome Sauce! You have just provided the best recipe for success that I’ve seen. This definitely will be shared on my #FacebookFriday thread this week! See you at #SMMW15. Yay, I’m so happy you found it useful Sherry. I felt like there was just too much conflicting advice out there and I wanted to give people the education to find their own answers. Kim, this is fabulous!! I’m excited to try these steps in my next report. Thanks! Glad to hear that Monica! Keep me posted how it goes! Thanks for sharing this approach, Kim. I agree that it’s important to measure the best times for your OWN audience rather than a blanket acceptance of someone else’s approach. The only problem is, we rely on post times to deduce any valuable data. If you post once a day, then you’re screwed. I don’t understand why Facebook doesn’t give time of engagement reports. I wish to see a post with all 24 hours along with reach and engagement so I know which hour did the best. Is there any tools that automate the excel calculation? If I was doing a report for an Australian page but I am in Canada, are the best times to post reported in Canadian time or Australian time? Thanks. Very helpful post Kim. Thanks for sharing. Have a landing page to download that awesome spreadsheet you built would be even better! Thanks for this great explanation. However, I’ve got a big issue. If you have some planned posts, Facebook considers that the posted time is the time when the action of planning is post is done and not the actual posted time. Hmmm, my Excel spreadsheet doesn’t come up with all those tabs. It just 1 tab with a bunch of gibberish. My export isn’t formatted correctly. There’s no space between the date and time, and all posts are saying 12AM!? I’m using OpenOffice, but not sure why that would/should make a difference. 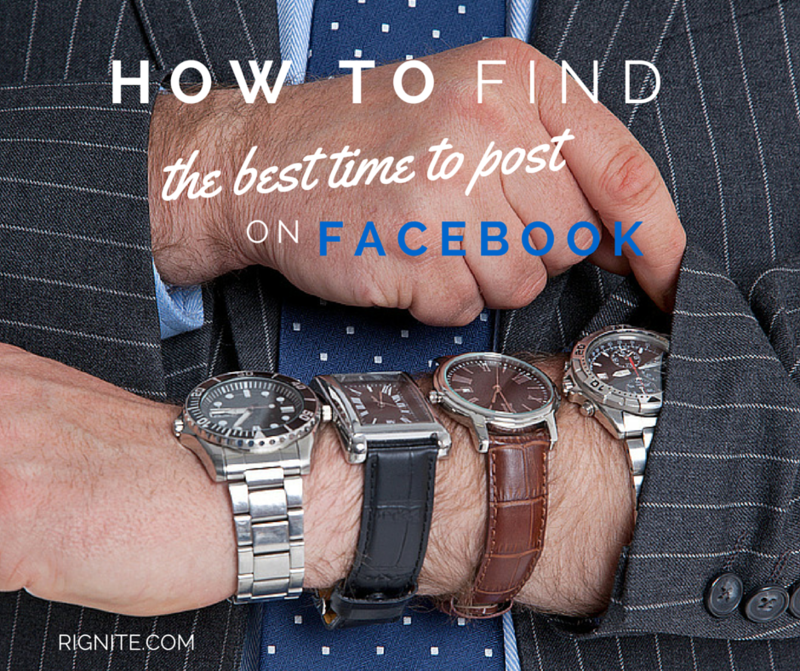 Thanks for sharing post about How to Find the Best Time to Post on Facebook.